Hot Cake is Japanese pancake but it is bit sweeter and thicker than pancake. 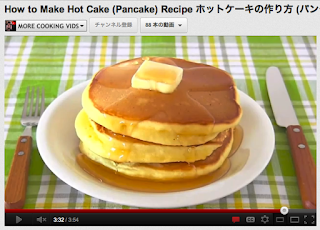 Morinaga's Hot Cake Mix is very popular product known for many years. If you follow the directions on its package, you can make gorgeous and fluffy Hot Cake, so I will show you how in this tutorial. Hot Cake Mix is versatile. You can make cakes, cookies, muffins, or any kind of sweets :D I will show you how to make them someday, so please learn basic Hot Cake recipe first! 1. Put egg and milk in a bowl and mix well. *Make sure you mix them together before you add the Hot Cake Mix! 2. Add Hot Cake Mix and gently cut through the mixture until somewhat combined. *Do NOT mix in a circular motion and DO NOT mix too much! 3. Heat a pan over medium heat (if you are using steel pan, oil the pan lightly), and place the pan on a wet towel to cool down the pan a little bit. *Use cooking timer to time. 4. On low heat, pour 1/3 of the batter from heights of 11 inches (30 cm) onto the pan, and cook for 3 minutes until bubbles appear on the surface. 5. Flip with a spatula, cover and cook for 2 minutes until browned on the other side. 6. Place a piece of butter on top and pour some maple syrup.